Restaurant Moon is much more than your local Thai takeaway. 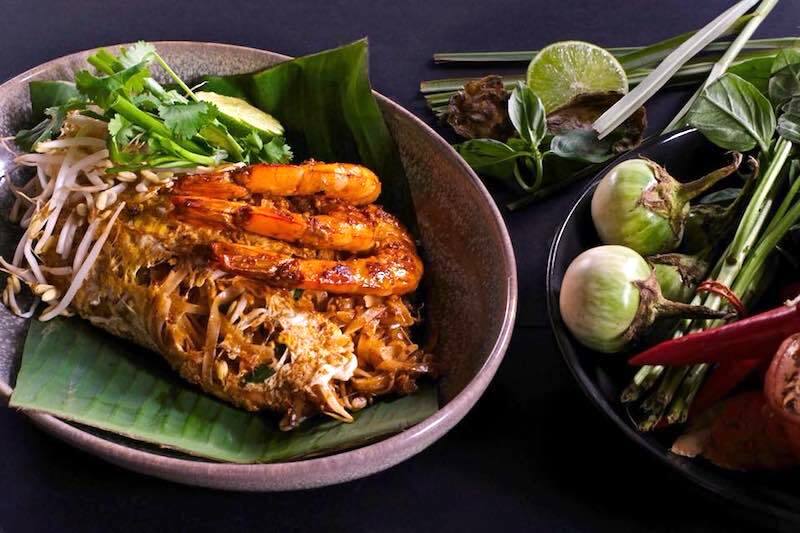 It’s the perfect blend of traditional Thai cuisine and modern European fare. 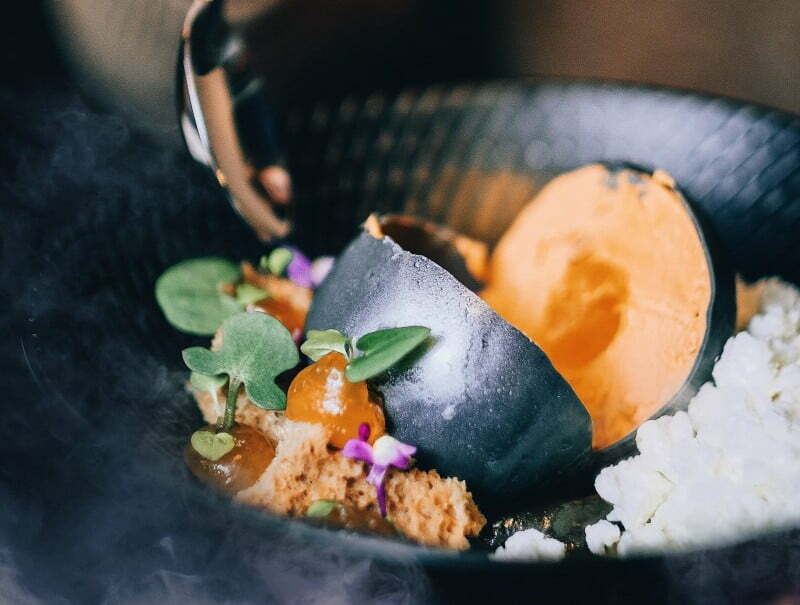 Restaurant Moon is carving its way through the engrained notions of Asian cuisine. With industrious and passionate co-owners Jackie Park and Touchpong Chancaw (Aum) at the helm, Thai food is taking on an elegant face in Sydney’s food scene. There’s a cosy little bar at the front of the eatery, a window into the busy kitchen and a crystal bowl filled with ice and oysters on top of the counter. A large, three piece artwork dons one of the walls. It’s an adorable depiction of a full moon hatching to reveal a baby budgie. The restaurant’s ingenious chef later shows us his tattoo of a bird on his arm. Astronomy and budgies aren’t the only thing Chef Aum is knowledgable in. He’s had 16 years experience across gastronomic kitchens in Europe, Asia and Australia. He’s trained under traditional Thai chefs but also studied European cuisine, notably French. Jackie Park spends the evenings dashing around the space, recommending dishes and checking in on his guests. It’s a really charming personal touch a lot of establishments overlook. Jackie has had 15 years hospitality experience across Korea, Malaysia and Australia. Along with Moon, he also owns Moss Bros Dessert Cafe, which has two locations. He tells us the restaurant is very social, with groups of people coming in and sharing many different plates, which is “the Thai way of doing it”. Restaurant Moon doesn’t just delve deep into the moon metaphor with its interior decorating. The evening menu is split into Crescent, Half Moon and Full Moon (plus Over the Moon for when it comes to dessert). We kicked things off with a couple of items from ‘Crescent’, which were appetisers and entrees. The menu changes at the will of Chef Aum. “Specials change every two weeks and the menu changes every two months. Or really it depends on the season. And my mood” Aum told us. The Salmon Betel Leaf ($6.50) is just one or two small bites. But what bites they are. Tasmanian house smoked salmon is served on top of a betel leaf along with caramelised coconut, chilli, lardo and a good heaping of salmon caviar on top. Everything about this dish exudes freshness. It was juicy and tangy and I wish I’d ordered at least three more. There aren’t any deep fried money bags or chicken satay on this menu. And truth be told, they weren’t missed. Not when Bone Marrow ($15) jumped in to replace the old school classics. Grilled grass-fed shinbones, fermented pepper relish and prawn crackers graced the top. The glaze had a welcoming kick and was incredibly flavoursome. The bone marrow itself, however, was the winning component and the unconventional prawn crackers were the perfect accompaniment to the rich, buttery marrow. You will probably recognise a couple of the dishes in the ‘half moon’ course. Classic Thai noodle dishes like Pad Thai make an appearance but not how you or your local Thai takeaway would know them. We opted for the Pad-Se-Ew ($22), served with smokey flat rice noodles, prawns and Chinese broccoli. The noodles had hints of the classic taste we all know and love but with a few improvements. The sauce was peppery and actually quite sweet. The large prawns were barbecued and as the description suggests on the menu, very smokey with a charcoal kick. 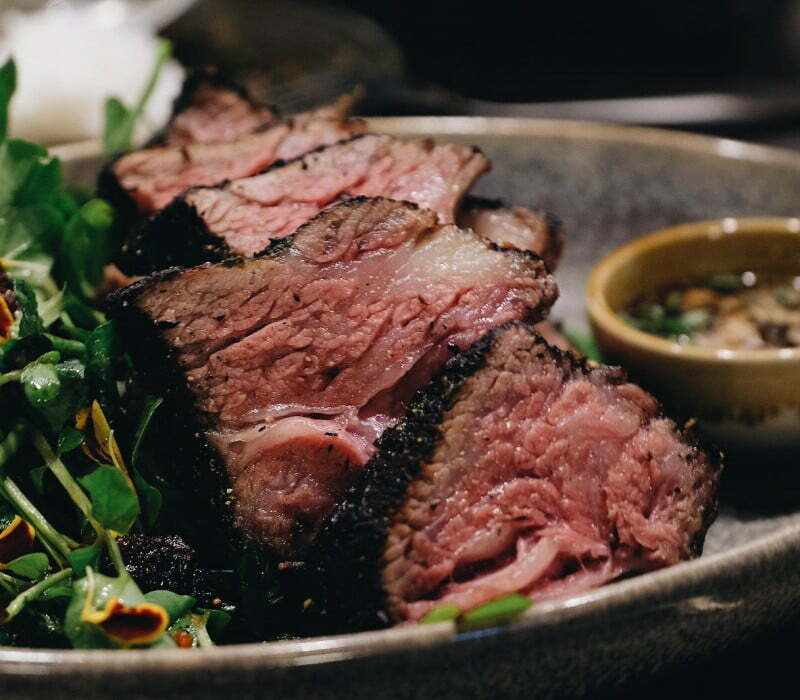 Our lovely waitress tells us the Beef Ribs ($38) are one of Restaurant Moon’s most popular dishes. So naturally, it was our first choice when ordering off the ‘Full Moon’ menu. 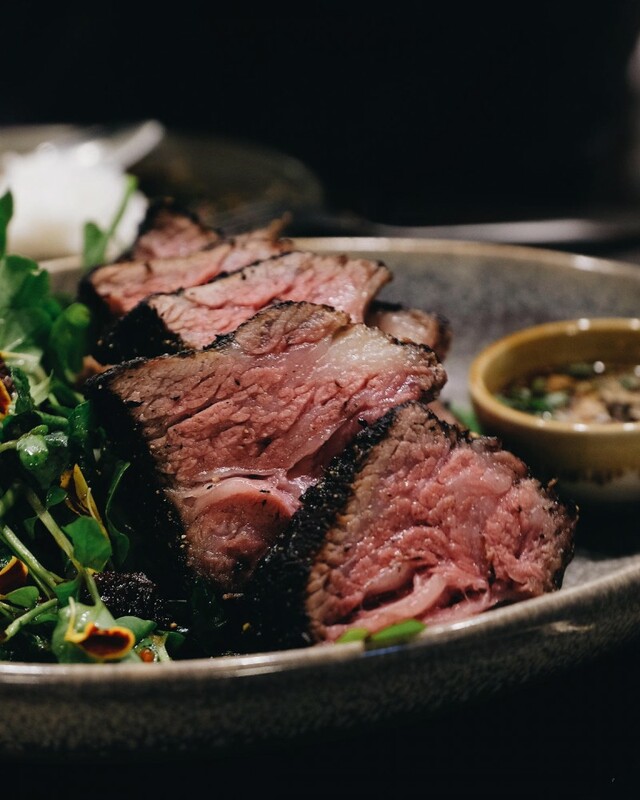 Braised for 72 hours, the Jack’s Creek ribs come with a tamarind glaze, semi dried tomato, dried chilli and watercress. It’s a very hearty serving, and a little intimidating. Especially after your first bite of beef when you realise how incredibly rich the meat is. It was cooked so perfectly that it melted in my mouth upon first contact. The little nuggets of pickled onion add a tangy twist on the side while the light greens provided fresh relief to the opulent meat. We were curious to see how a tofu dish would fair at Restaurant Moon, and so we also ordered the Tofu Cashew Nut ($16). Thankfully, we weren’t disappointed. While tofu can be pretty underwhelming in flavour, Chef Aum provided the perfect marinade and sauce. The stir fried silken tofu swam in chilli jam, shallots and dried chilli. It tasted almost like a complex, sweet chilli sauce. The contrasting textural elements of the tofu and cashews were really enjoyable and flavoursome. We couldn’t help but glance at the dessert menu at the end of our meal and were ‘over the moon’ when we read the description of Moon’s signature dessert. The Fly Me to the Moon ($18) is an activated charcoal dome (shaped like a full moon!) with Thai tea mousse, a lemon caramel gel, honeycomb, cream cheese and marshmallow plus herbs. Whilst there were elements of Thai influence, this dessert was clearly born out of European gastronomy. It’s a piece of art in itself. 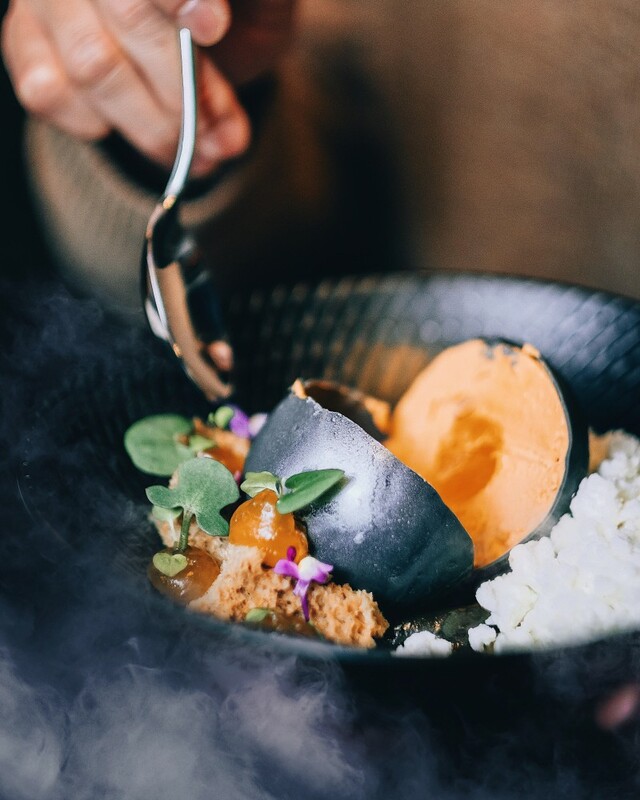 Liquid nitrogen is poured over the top, freezing all the elements of the dish and adding an interesting textural element. The citrus tang of the lemon gel meld wonderfully with the creaminess of the mousse. Cracking into that chocolate moon was very satisfying but not as satisfying as the incredible flavours it held. Restaurant Moon is open Tues-Fri 11.30am-2.30pm & 5.30pm-10pm, Sat & Sun 5.30pm-10pm. Closed Monday.